Schulyer’s brand of “unique,” at times contradictory, left-leaning politics ended abruptly sometime after WWII. Having spent near a decade working for the NAACP, he became caught up in the Red Scare hysteria of his age and–denouncing socialism–took a hard turn to the right. In 1947 he would pen The Communist Conspiracy against the Negroes and even contribute to ultra-right groups like the John Birch Society. The emerging Civil Rights movement became a favorite target, and no one was spared–including Dr. Martin Luther King Jr. Stiffly opposing King’s awarding of the Nobel Peace Prize, Schuyler wrote a scathing letter calling King a fraud and comparing his message to a disease: “Dr. King’s principal contribution to world peace has been to roam the country like some sable Typhoid Mary, infecting the mentally disturbed with perversions of Christian doctrine, and grabbing fat lecture fees from the shallow-pated.” The editorial was so inflammatory, the Courier refused to publish it. In 1966 Schulyer detailed his emergent political philosophy in an autobiography, Black and Conservative. By his death in 1977, his views, and his often scornful rhetoric, left him largely disconnected with the larger African-American community and his name mostly disappeared. Yet, Schulyer couldn’t be forgotten altogether. I first learned about him in the 2000 excerpt of his story of race and satire Black No More which was included in the anthology Dark Matter: A Century of Speculative Fiction from the African Diaspora. 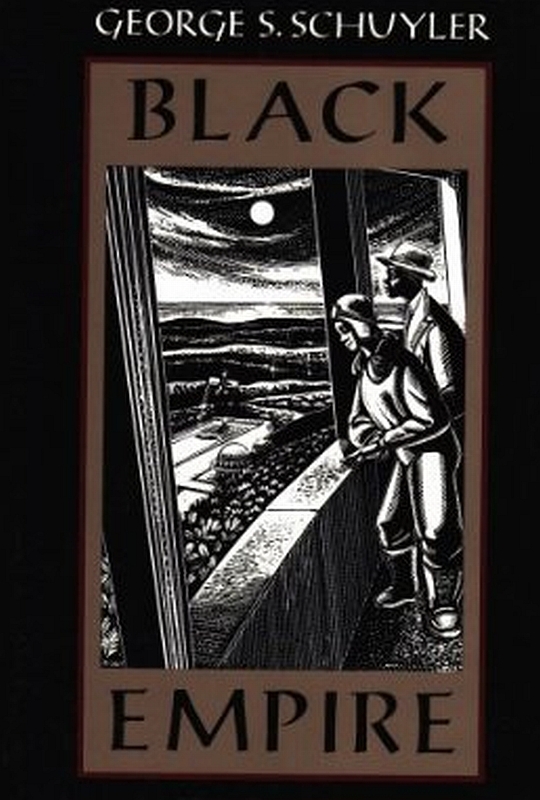 Originally printed in 1931, the novel tells the tale of an inventor named Dr. Crookmore who creates a “black-no-more” treatment, allowing anyone to change their skin-color from black to white–down to their features and hair texture, which is made over as blonde. In short time, the United States is populated by all white people–leading to a massive identity-crisis and series of unforeseen events. Predating Dr. Seuss’s children’s tale of star-bellied Sneeches by thirty years, Schulyer’s satirical tale of mad-science gone wrong doesn’t fail to disappoint in its controversy. Unsparing in its condemnation of both blacks and whites, the story creates caricatures of well-known black activists and even seems to compare the KKK and the NAACP, as huckster organizations who used race their own ends. It is in this vein, as the leftist critical of the black political institutions and movements of his era, that in 1936 Schulyer began publishing his serials of Dr. Belsidius and the Black Internationale. Pulling once more on speculative fiction, Schulyer tells his story (fittingly) from the perspective a black journalist, Carl Slater. By random chance, Slater witnesses the murder of a white woman by a black assailant who then kidnaps him. The murderer is Dr. Belsidius, who is in the habit of seducing wealthy white women for his diabolical aims. Slater is persuaded to work for Dr. Belsidius (declining the offer means death) and is introduced to the secret underworld of the Black Internationale. In Black Empire, Schulyer’s political and social ideologies are recast in myth and metaphor. Dr. Belsidius, is both a megalomaniac and a genius, a shrewd towering figure of black masculinity able to manipulate with his wit (he uses dashing white women as secret agents) and capable of ruthless brutality in pursuit of his aims–like some fantastic blending of Marcus Garvey with the fascism that Schulyer would have seen sweeping much of the world at the time. Dr. Belsidius is the founder, creator and leader of the Black Internationale, a group whose sole aim is to unite the black world to overthrow white racial hegemony. This begins by a meeting of the diaspora, pulling together blacks from the Americas, the Caribbean, Europe and colonized Africa. Dr. Belsidius presents his plans to them without a chance of refusal; those blacks who are skeptical he labels as race traitors, who are subsequently killed. Dr. Belsidius is an inventor extraordinaire, utilizing super science in the form of solar power, underground aircraft facilities, hydroponics, eugenics and death rays in his plans of world conquest; there is even the prediction of revolutionary new inventions like the fax machine, and on a much more somber note, the gas chambers of Nazi Germany–essential dieselpunk in all its wonder and horrors. He even invents a religion to help unify black people the world over. Pulling on his beliefs in the innate simplicity of the human psyche, Dr. Belsidius creates the Church of Black Love–complete with a set of tenets, prayer and idol. Its adherents are lulled into acceptance of its orthodoxy by the release of a gas, that renders them so giddy they roll around on the floor and shake and speak in tongues. …all great schemes appear mad in the beginning. Christians, Communists, Fascists and Nazis were at first called scary. Success made them sane. With brains, courage and wealth even the most fantastic scheme can become a reality. I have dedicated my life, Slater, to destroying white world supremacy. My ideal and objective is very frankly to cast down Caucasians and elevate the colored people in their places. I plan to do this by every means within my power. I intend to stop at nothing, Slater, whether right or wrong. Right is success. Wrong is failure. I will not fail because I am ruthless. Those who fail are them men who get sentimental, who weaken, who balk at a little bloodshed. Such vermin deserve to fail. Every great movement the world has ever seen has collapsed because it grew weak. I shall never become weak, nor shall I ever tolerate weakness around me. Weakness means failure, Slater, and I do not intend to fail. Seeming to predict WWII, Schulyer writes Dr. Belsidius as a mastermind who foments war and tension in the United States and Europe, all meant to weaken the colonial hold on Africa. The Italians play a key role as the enemies of Africa (no doubt an allusion to the Italian conquest of Addis-Ababa, which would have been popular in the minds of readers) and bear the brunt of Dr. Belsidius’s wrath. In time the Internationale is triumphant, and Africa is liberated–only to fall under the control of Dr. Belsidius, who becomes both ruler, god and tyrant. To understand Black Empire, one has to understand Schuyler. As you read his work, you realize early on it is satire, and bitingly so. The Black Internationale is no vision of utopian black nationalism or Pan Africanism existing on a higher moral plane. In its Machiavellian motives, it is as amoral and oppressive as that which it fights against. It paints the black struggle, black race consciousness and race pride as the work of charlatans and flim-flam men, peddlers of fantasies and snake oil. The Black Internationale, like the Church of God, are really machinations of one twisted mind, tools towards an ultimate goal. And its black adherents are superstitious, pliable, gullible and easily manipulated. Yet at the same time, Schulyer can’t help but instill some form of grudging admiration for what he mocks. Dr. Belsidiuis is smart enough to outwit his white enemies; the black scientists and inventors he recruits are able to achieve wonders beyond the white world; and, probably most important, the Black Internationale is brilliantly effective. It is Pan-Africanism, black nationalism and race pride–which he often ridiculed in real life as impractical–working (in its own way) and exacting change for black people. In a sharp analysis and overview featured in the afterword of the reprint, Robert Hill and Kent Rasmussen suggests that this was no coincidence, hinting that Black Empire may have been a type of mask for Schuyler’s own radical vision. In Dr. Belsidius and the Black Internationale is a form of black radicalism that moves beyond the passivity he saw in the Black Talented Tenth and the impractical pomp of Garvey and the UNIA. It is a tale that fits Schuyler’s own hopes for black mass mobilization, the type that if effective would have found a way to liberate Ethiopia and fight against global discrimination. And now, a word of warning to the black people of the world. You have a great empire created out of black brains and strength…. You must not make the mistake of the white man and try to enslave others, for that is the beginning of every people’s fall. You must banish race hatred from your hearts, now that you have your own land, but you must remain ever vigilant to defend this continent which is rightfully ours. I have led you to victory…. Now I shall lead you to a higher civilization than Europe has ever seen, with your consent. The glory that was once Egypt’s and Ethiopia’s and Benin’s and Timbuctoo’s and Songhoy’s and Morocco’s shall again make Africa first in the family of nations. It is on this note of denouncement of white hegemony, and the possibility of a black run world cleansed of race-hatred, that Dr. Belsidius, and by extension Schulyer, ends his tale. The last words in the story are of Slater’s description of a white woman, Martha Gaskin, one of Dr. Belsidius’s key agents, shedding tears and wringing her handkerchief at their leader’s words. We are left to ponder the reason for her tears. Is she crying because she knows her part in the overthrow of white global dominance? Or is she equally overjoyed at the end of the burden of white supremacy and the possibility of a world cleansed of racism? And perhaps indeed, the last laugh was on Schulyer. Black Empire remains one of his most popular remembered works of fiction, and saw a reprint in 1991–in part with the help of none other than the Marcus Garvey and UNIA Papers Project at the University of California. Dr. Belsidius, the ultimate mad genius, may have in the end outwitted his own creator. This entry was posted in Intellektshul, Literary Reviews and tagged Africa, African-Americans, Black Empire, colonialism, dieselpunk, George Schuyler, Harlem Renaissance, Race, Racism, science fiction, Speculative Fiction by The Disgruntled Haradrim. Bookmark the permalink. This is really fascinating stuff. I am a historian of Pan-Africanism and one of the things that interested me about Harlem in this period is the mix of political persuasions- literally from Zionism to early Arab Nationalism to Pan-Africanism- Maxist and moderate. Thanks for sharing this book with us, appreciated. This is very good. I learned a lot that I never knew about Schuyler. I’m actually working on a sort of sequel to “Black No More”. After reading this, I may incorporate some of his “Black Empire” stuff as well. Thanks for reading. Schuyler was an interesting kind of guy. Speaking of interesting–that name (Race Man Answers) for a book. My ebook version of “RaceMan Answers” is starting to gain steam. It should gain even more after the article in the Chicago Tribune’s Printers Row literary supplement runs this Sunday, Oct. 19. Speaking of Harlem in the 20’s and 30’s, a new book on the subject featuring Schuyler’s “white” wife among other “uncolored” women offers some interesting info on Schuyler and the period. I’d recommend, “Miss Anne in Harlem” to anyone.